Abstract Deadline: February 12, 2019. Air Quality: Science for Solutions is an annual conference on air quality, especially for Utah and the Intermountain West. It began with a pair of conferences by the same name hosted by the Utah Department of Environmental Quality, Division of Air Quality; the Program for Air Quality Health and Society at the University of Utah; and the Utah State University Bingham Entrepreneurship & Energy Research Center in 2015. The mission of this conference is to bridge divides that separate researchers of various disciplines from each other, from professionals in the industrial and regulatory realms, and from the public, and to facilitate a cross-pollination of ideas working towards the development of solutions. Papers and posters related to air quality issues (science and policy) in montane environments are welcome. We have a range of papers representing research from undergraduates to Ph.D.s. and academia to industry. A major goal of this conference is the cross pollination of ideas. Here is this year's Conference Schedule as a pdf. The subject of this conference is air science. Topic areas include atmospheric chemistry, health impacts, meteorology, emissions, modeling, and public policy. While this conference specializes in topics associated with air quality issues important to Utah and the Intermountain West, presentations on air quality topics that are related in some way will also be considered. There are no parallel sessions. Please make oral presentations understandable, at least in part, to air scientists from all fields. A major goal of this conference is the crosspollination of ideas between fields of study. The oral talks are 15 minutes long with 5 minutes for questions and change over to the next talk. Posters will be on display during the entire one-day conference. There will be at least one session dedicated to posters and all breaks plus lunch will be held with the posters. This conference is made possible by the generous financial support of the following organizations. 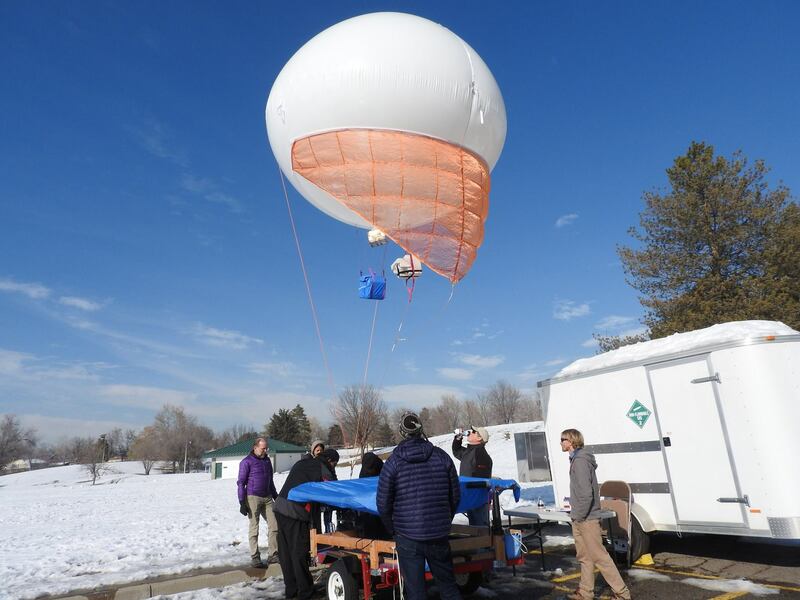 Tethered atmospheric sounding balloon for making air measurements from ground level to 200 meters AGL. In this image are faculty and students from Weber State University, University of Utah, and Utah State University working together for the 2016 Winter Fine Particulate Study. Click on the image for a larger version. Image: Sheri Trbovich, Weber State University, HARBOR program. Copyright © 2018 Weber State University, Physics Dept.. All Rights Reserved.